We have established internal rules, such as risk management rules and disaster prevention rules, and have established a risk management system, so that if we face or predict a serious risk, we can take prompt and appropriate action and ensure sound business operation. We have reviewed our management structure in line with the in-house company system we adopted in April 2017. As part of the review, in May 2017, we changed the name of our organization that considers matters related to large earthquakes, from the Earthquake Preparedness Committee to the Earthquake Preparedness Promotion Committee, and we improved the level of practice and implementation. We also reviewed our Companywide Disaster Preparedness Organization and clarified its activities in chronological order, from (1) Earthquake occurrence to initial response, to (2) After initial response to recovery. We have newly developed a curriculum for "risk management" designed for training of all job classes, where we explain how risk management is positioned and emphasized in CSR and actual cases of crisis at Aichi Steel to heighten employees' risk awareness and ensure they understand what to do to prevent crisis occurrence/recurrence and initial actions to take when a crisis occurs. As a result of the accident on January 8, 2016, we have declared January 8 to be Start Over Day at Aichi Steel to raise awareness of our commitment, confirmed by everyone at Aichi Steel, to preventing such an accident from recurring. 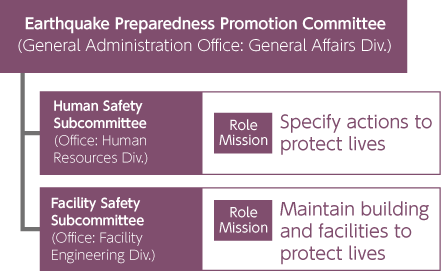 The Earthquake Preparedness Promotion Committee (name changed May 2017) has systematically implemented disaster prevention measures based on the action roadmap established in March 2012, and from the key perspectives of (1) prioritizing human life, and (2) business continuity (BCM). The committee also considered damage that occurred as a result of the April 2016 Kumamoto earthquakes, identified some new concerns, and reviewed its disaster prevention plan. The main actions implemented by each subcommittee during fiscal 2017 are detailed below. 2. Measures to minimize damage to buildings and equipment, etc.